The Proform Power 545i treadmill provides a powerful feel and quiet operation thanks to its 2.5 CHP Mach Z™ motor and has a top speed of 18kph (11.2mph) to let you boost your fitness level to an all-time high. 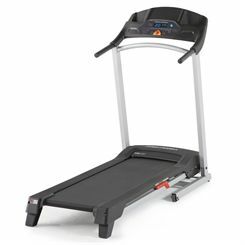 For a more efficient workout, you can choose from 10 levels of incline and for maximum comfort while running, walking or jogging, there is a roomy 51cm (20”) x 140cm (55”) running deck. Adjust speed and incline quickly via Quick Speed and Incline controls and check your progress on a user-friendly multi-window LED display with an integrated calorie burn meter. To help you challenge yourself and give legs a little extra burn, the 545i has an impressive selection of 31 programmes and it uses iFit® Coach BLE technology to give you access to unlimited fitness library. 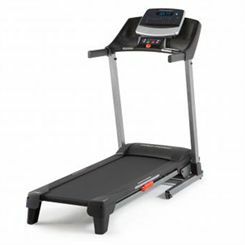 Equipped with ProShox™ cushioning throughout the deck area, the treadmill is easy on the joints and features 1.9” precision machined and balanced non-flex rollers to minimise wear and tear. Also, to enable you to entertain yourself when working out, the machine offers a music port for iPod®/mp3 player, two 2” speakers and an integrated, adjustable tablet holder. 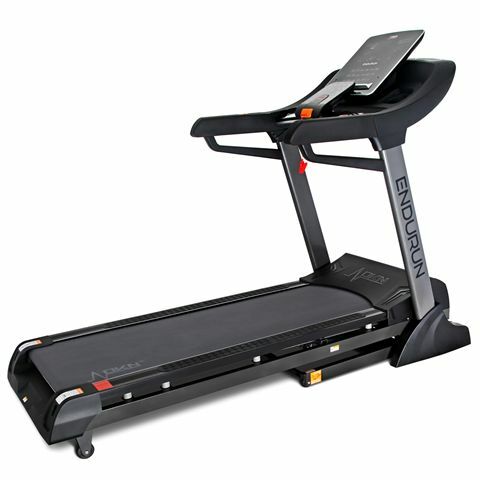 The EnduRun from DKN is the brand's top of the range machine treadmill. A premium machine, designed for serious runners, it's powered by a commercial grade 2.5 HP Continuous (4.5 HP peak) AC motor. This motor smoothly and easily drives the belt all the way up to the top speed of 22kph (13.7mph) which is more than enough for the fastest of sprints and the incline range of 0-15% makes the machine versatile and very well suited to those whose primary goal is weight loss. The oversized running deck is very spacious measuring 53cm (21") by 151cm (60") and the finely tuned cushioning system absorbs heel impact whilst providing a firmer surface to push off from. All essential workout feedback is provided on the console via brilliant white LED displays. A great range of built-in programmes include 18 pre-set ones which are designed by a certified personal trainer and the machine has a bluetooth module built-in to allow it to be paired with a phone or tablet and controlled by the Kinomap app. The NordicTrack Commercial 1750 treadmill is a solid and sturdy machine powered by a strong, yet quiet 3.6 continuous horsepower DurX™ Commercial Plus motor that speeds the belt up to 22kph (13.6mph) making it suitable for serious runners. With its durable WhisperQuiet design, it reduces noise and friction for a quieter run and there are 2.5" precision machined and balanced non-flex rollers to deliver smooth performance and minimise wear and tear. This feature-packed treadmill has an oversized 55cm (22”) x 152cm (60”) running surface to provide an extra sense of security when running and Flex cushioning reduces impact on your joints. Enjoy your favourite media, listen to workout-worthy tunes or audiobooks and surf the net thanks to a pivoting tablet holder and iPod/MP3 player compatible Bluetooth audio system and monitor your progress on a 7" full-colour capacitive touchscreen display. An impressive decline/incline range of -3%-15% allows for adding variety to your training and responsive Onetouch™ controls enable you to adjust speed and incline/decline with a touch of a button. The treadmill offers a great selection of programmes with a manual one, daily updated map based workout, as well as access to over 50 video workouts and has iFit Coach functionality (12-month subscription included) to custom-tailor your training and maximize gains. Plus, for accurate heart rate measurement, it features hand pulse sensors and a wireless receiver with an included iFit Bluetooth™ Smart chest strap. DKN’s EzRun is a full-spec model that offers excellent value for money. With a reliable motor that powers a high max speed of 20kph (12.4mph) and incline up to 12% so you can walk, run and train at the intensity you require. The deck is generous sized and well cushioned so running is more joint-friendly and there are plenty of features such as lots of workout programmes and a Bluetooth chip so you can use the compatible Kinomap app. The folding system means it will fit into homes easily and take up less floor space when not in use. 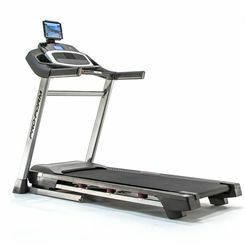 Get to your tone-goal, improve heart health and maximize fat burning with the Proform Power 525i treadmill. Smooth and quiet performance is ensured by its powerful 2.6CHP motor and a top running speed of 18kph (11mph) is sure to challenge you and provide effective and enjoyable cardio sessions. To let you stay focused on your workout, the 525i has Quick Speed™ and Quick Incline® controls for easy selections and 10 levels of power incline allow for targeting different muscle groups for better results. A good sized 140cm (55.1’’) x 46cm (18.1’’) running area guarantees comfort and safety as you run and ProShox™ cushioning system makes the machine joint-friendly and enables you to train with less stress on your feet, ankles, knees and hips. Programme wise, the 525i offers 20 pre-set workout apps and a manual option and it is compatible with iFit® Coach BLE technology letting you enhance workout experience by training anywhere on the globe and giving you access to an immense workout library. Live workout feedback is shown on a clear and easy-to-read 5" high contrast, multi-colour display with km/mi switch and an integrated tablet holder keeps your device conveniently close to have all the training tools and entertainment must-haves easily accessible. 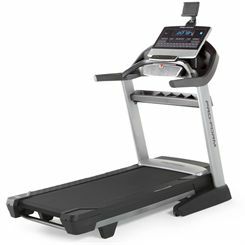 The NordicTrack Commercial 2950 is a heavy-duty treadmill with a high-end 4.25 CHP DurX™ Commercial Pro motor and durable WhisperQuiet design that reduces the noise of each step on the tread deck. The machine is fitted with a huge 21.5” full-colour capacitive touchscreen display made to bring motivation through Interactive Coaching. It has a roomy 55cm (21.6”) x 152cm (59.8”) deck, 2.5” precision machined and balanced non-flex rollers reducing wear and tear to minimum, as well as a stretch-resistant 2-ply belt. With decline/incline range of -3-15%, the machine allows for quick, 1-Touch™ adjustment and enables you to activate different muscles for faster results. Stream dynamic, high-energy studio workouts in the comfort of your home and exercise with world-class trainers in diverse locations thanks to iFit Coach technology (12-month subscription included) and enjoy HD video workouts featuring past segments of Tour de France. Thanks to customisable RunnersFlex™ cushioning, you can choose between a cushioned deck for knees and ankles protection and a firm, stable surface that simulates road running. For quick and accurate heart rate readings, the 2950 features EKG pulse grips and a Bluetooth® Smart wireless receiver with an included chest strap. Once you’ve finished exercising, effortlessly fold the treadmill up and out of the way with its unique SpaceSaver® folding system with EasyLift™ Assist. 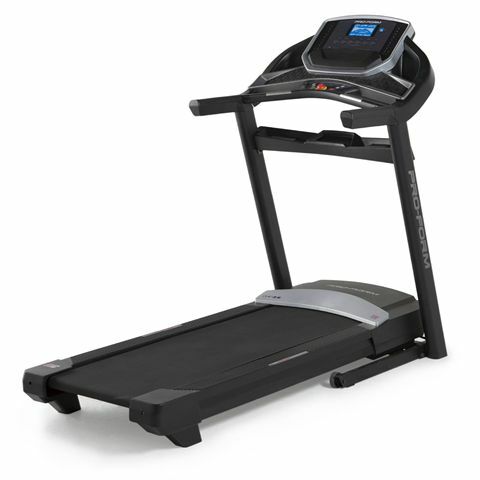 The ProForm Pro 5000 treadmill has a seriously powerful 3.75 CHP motor that speeds up the belt all the way to its maximum speed of 22kph (13.7mph). Thanks to direct speed and incline buttons, you can quickly adjust your workout and there is a decline/incline range of -3–15% to simulate the slopes of natural terrain and let you increase calorie burn. The running surface is huge (55cm x 152cm) to make the Pro 5000 comfortable to run on even for the tallest of runners and at the centre of the console sits a dazzling 10" full colour capacitive touch display providing live workout feedback to let you keep track of your achievements. Programme wise, there is a manual one, as well as a daily updated map based workout, and the treadmill gives you access to over 50 challenging and exciting video workouts. To enable you to maximize training experience and choose from countless interactive workouts designed by world-class trainers, the Pro 5000 is compatible with iFit Coach technology (12-month subscription included). The machine is easy on the joints due to ProShox™ cushioning system and features 2.5” precision machined and balanced non-flex rollers for increased durability and noise reduction. Surf the net and pump the tunes for better results with an integrated pivoting tablet holder and a built-in sound system with dual 3-inch speakers and fold the machine up and out of the way using SpaceSaver® folding design with EasyLift™ Assist. To measure your heart rate, the treadmill features hand pulse grips and Bluetooth® Smart wireless receiver for use with an included chest strap. 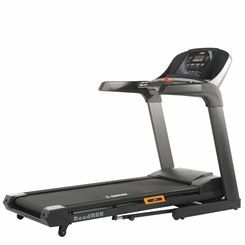 Why should I buy a treadmill? 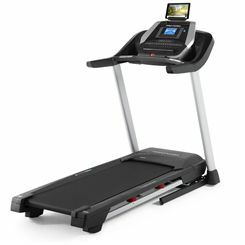 So let's take an in-depth look at these running machines and see what you need to consider when looking to buy a treadmill. I’m short of space, do you sell folding treadmills? Yes, and this is a very common concern when shopping for treadmills, but there’s no reason to worry. 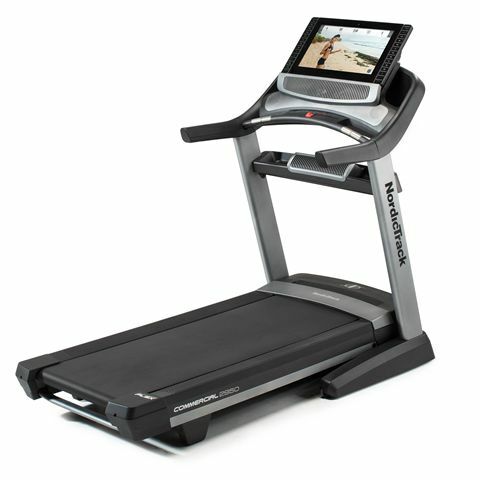 The great majority of treadmills are actually folding treadmills, with a folding system that allows you to bring the running deck up towards the console. This means that once you’ve finished your session on the machine you can simply step off it and fold it away, reclaiming that all-important floor space. It also makes it easier to clean around the treadmill. Your treadmill’s user manual will show you how to fold your exact model, but a general guide is to unplug it and take out the safety key, then lift from under the deck, gently bringing the rear of the deck up to a more vertical position. A safety latch will engage and keep the deck in place until you lower it down for you next session. Once in the folded position it will also enable you to move the machine if you need, although we do advise designating a dedicated space for your running machine and leaving it there. One exception are flat folding treadmills. These are designed for vertical storage against a wall or under a bed or sofa. The uprights and console fold down into the deck, making it completely flat with an even smaller footprint. So how do I choose the right treadmill for me? Start off by asking yourself a few questions. What will I use my treadmill for? And how often? What’s my budget? How much space do I have at home? Your answers will help narrow down your search. If you want to walk or jog gently a couple of times a week then a model with a small or medium sized deck (see the deck size section below) and a lower top speed along with incline levels will suit. If you plan to run regularly or want to train for events then you’ll need a larger machine with a standard or oversized deck, high max speed and generally a strong build. 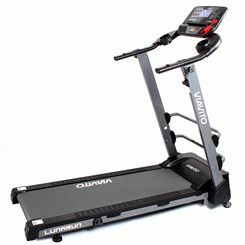 Prices start around the £400 mark and go through the £700-£2000 range for full feature models, right up to £10k for the very top-of-the-range commercial treadmills. Know where you plan to put the treadmill and how much space there is. Treadmills are heavy pieces of kit so we don't recommend you plan on moving them regularly. However, as mentioned above, most treadmills are folding treadmills with a deck that folds up towards the console to save floor space, and there are some that fold completely flat, making storing it much more practical and meaning you can move them more easily. What Running Deck Size Do I Need? 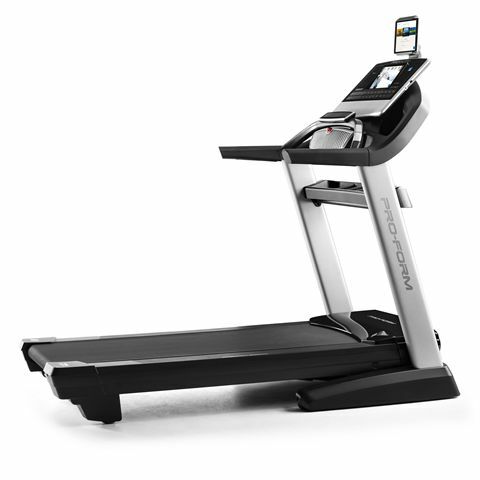 • Extra Small – any treadmill with a deck width of under 40cm or a length of less than 120cm falls into this category. As a rule of thumb, treadmills with deck sizes this small are only suitable for indoor walking and jogging on them may not be safe. 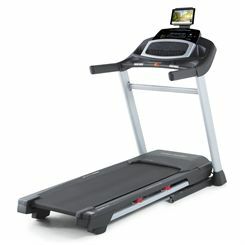 It should be noted that quite a number of treadmills being sold in the UK market (not by us!) with extra small deck sizes do not actually meet the European safety requirements and should be avoided at all costs. • Small – deck width of 40cm (15.75”) and a length of 120cm (47”). This treadmill deck size is suitable for fast walking or jogging by users of any height. Shorter users (up to 155cm / 5ft 1in) should be able to run relatively comfortably. • Medium – Typically 45cm wide and between 125cm and 130cm in length. • Standard – The most popular running deck size for runners typically measuring 50cm in width and 140cm in length. This size of running belt is suitable for pretty much runners of any height to be able to go right up to sprinting speeds comfortably. • Oversized - Some running decks have a length of up to 160cm and there are now extra wide models also available that are as much as 56cm in width. The additional size on a running belt is a nice luxury for those with the space and budget for a treadmill with an oversized deck, as it enables all users to run as fast as they like without having to worry about their position on the running deck. • Motor - the motor speeds the running belt and powers the incline. 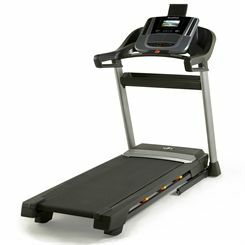 Most treadmills will have a continuous horsepower (CHP) output of between 2 and 4 CHP which should cover most home needs. If you're planning to use the treadmill to run more than walk or jog you'll probably want more power rather than less. • Speed Range – a 10mph (16kph) top speed will be fine for most walkers and joggers. Runners will want a higher speed, and higher spec machines can boast belt speeds of over 14mph (22.5kph). • Incline – usually measured in % or levels, running or walking on an incline will burn calories faster, engage muscles more deeply and compensate for the lack of wind resistance compared to running outdoors. • Workout Programs & Apps – these offer variety to help motivate and challenge you. Interval training, fat burning, time or distance targets, and heart rate control are some treadmill workout modes. New machines are often compatible with programs and apps such as iFit that pair with your tablet to give you a world of interactive training, more user profiles and personalised feedback, features such as running with Google Maps and much much more. Some manufacturers have their own apps and there are third party apps and programs that will work with compatible treadmills too. • Cushioning – cushioning under the deck supports your strides and softens impacts, making treadmill running gentler on joints than road running. • Heart Rate Monitoring – keep track of your heart rate with hand grips or wireless receiver and a chest belt. Working out in specific heart rate zones helps you optimise your training for better calorie burn, improved aerobic fitness and metabolism and many more health benefits. Some treadmills will offer heart rate control programs where the machine alters the speed and/or incline to keep you exercising in the selected heart rate range. 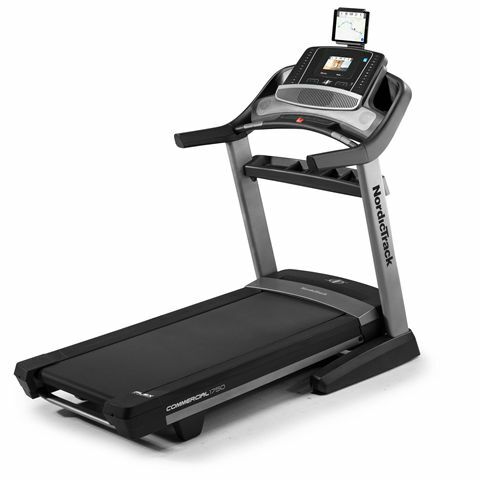 Newer treadmills might now boast Bluetooth heart rate technology which uses a more reliable Bluetooth connection to send your data from the chest strap to the treadmill. • Extra Features – audio jacks and music speakers, Bluetooth connectivity, touchscreen displays, built-in web browsers, fans and other such features are just some of the ‘bells and whistles’ that you can find on treadmills. Whilst they are nice to have, they are by no means essential. Do keep in mind that some manufacturers will not include too many extras and concentrate on build quality instead. • Pricing – our buying power means we buy at lower prices than most retailers and we pass these savings on to our customers. • Delivery Experience – typically, running machines are heavy, bulky items. We’ve refined our delivery processes to ensure that all of our bulky treadmills are delivered by a trained 2-man delivery company. If the boxed weight of the machine is over 85kg and the delivery is to a non-ground floor locations, we are still able to deliver the treadmill by using a specialist network of fitness equipment installers in mainland UK. For a small additional fee, we also offer as assembly service for all of the treadmills in our range. You’ll find product-specific delivery info on each product’s page. • After-sales – Whilst most retailers only stay involved until the delivery of the machine and leave customers at the mercy of the supplier brand if anything goes wrong, Sweatband.com has a dedicated & trained warranty after sales team in place. In the event of the treadmill developing a fault, we are happy to be the first point of contact and hold the supplier brand to account to ensure that our customers are looked after properly. 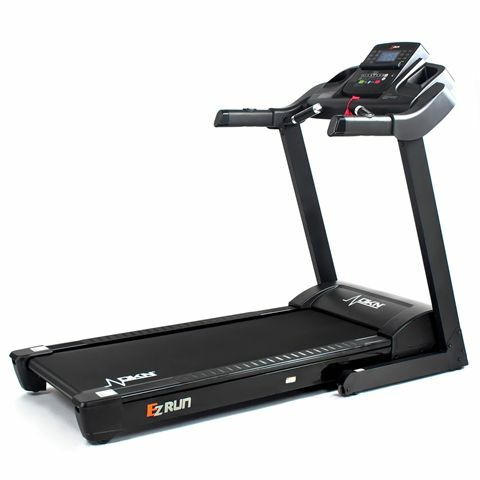 Scroll up this page and you can start browsing our range of top-quality home treadmills. The filters will help you concentrate on machines that fit your criteria – deck size, price, brand. And if you need any further help you can pick up the phone and one of our specialist advisors will be more than happy to answer any questions.